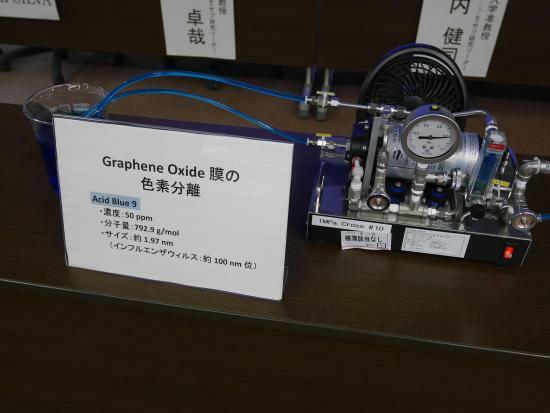 Press Release "Contribute to Solving World Water Problems -Success in developing easy & technically advanced fabrication method of hybrid graphene oxide/graphene layered water desalination membranes- possessing effective NaCl & dye rejection properties"
On August 29th of 2017, Global Aqua Innovation Center at Shinshu University (AICS) developed a novel carbon-based water separation membrane consisting of hybrid layered graphene oxide / graphene, and found effective NaCl and dye rejection properties. This water separation membrane has high robustness (chemical resistance, heat resistance, etc.) characteristic of nanocarbon materials. This developed membrane can be made by an original method by spraying a water-based mixture of graphene oxide/graphene that is self-assembled to be aligned parallel to the surface. This process has a great advantage for practical applications because it easily produces large membranes at a low cost. Following the publication of this research in Nature Nanotechnology (Impact Factor: 38.9), a press conference was held. At AICS, under the COI STREAM (Center Of Innovation Program) promoted by the Ministry of Education, Culture, Sports, Science and Technology (MEXT) and the Japan Science and Technology Agency (JST), we aim to construct an innovative water desalination and water circulation system in order to contribute to securing safe and potable water that is a global issue. Since this research result was also achieved as part of the COI program, we announced it with JST. The research group of COI succeeded in developing a nanocarbon membrane for advanced water treatment by skillfully creating a layered nanostructure of a hybrid graphene oxide and graphene mixture, which is one of the remarkable structures of nanocarbon. To be more precise, a thin active membrane having a thickness of dozens of nanometers is formed by spraying a liquid mixture of graphene oxide and graphene on a porous polymer-based material, whereby salt and dye can be rejected with high selectivity. In this process, it is possible to control the properties of the membrane according to the purpose, and it can cope with a wide range of requests for water treatment. Although it does not reach the current reverse osmosis (RO) membrane performance at the present time, this novel membrane composed of only graphene has great scientific significance and it shows a new possibility for RO membranes. Meanwhile, another graphene oxide membrane developed by Dr. Abraham is fragile and weak against pressure, indicating that it cannot be used for practical water applications with cross-flow filtration. The novel membrane developed at COI proved stable water permeability under the high pressure of 5 MPa with cross-flow filtration, an actual seawater treatment system, and the permeability of this novel membrane is about 30 times higher than that of Abraham's membrane. In addition, the novel graphene membrane has various excellent practical features such as chlorine resistance, shear resistance, tolerance for long-term operation and easy scale-up fabrication. It is easy to produce large-area membranes because of the simple spraying method. Therefore the developed membrane technology outperforms previously published papers both in terms of performance and fabrication method (patent pending). This nanocarbon separation membrane is expected to be applied widely for produced water treatment and in various industry fields in addition to seawater desalination. At AICS, we will further promote research and development of both basic science and applied technology, and implementation in society. 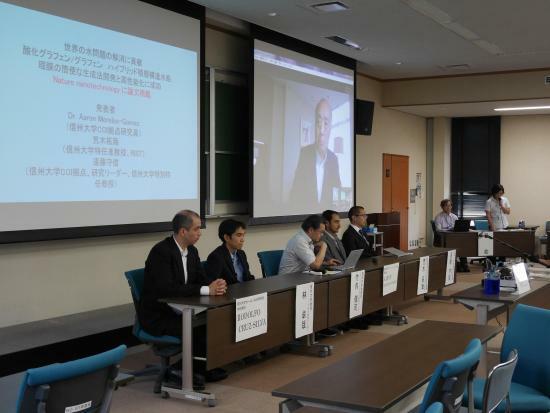 The press conference was held on August 29th at the Engineering Research Building in Shinshu University Nagano (engineering) campus. Distinguished Professor Morinobu Endo (COI research leader), Associate Professor Kenji Takeuchi (COI sub research leader), Dr. Aaron Morelos-Gomez (COI researcher), Professor Takuya Hayashi (COI sub research leader), Distinguished Associate Professor Takumi Araki (Research Organization for Information on Science and Technology), Dr. Rodolfo Cruz Silva (Specially Appointed Professor of Institute of Carbon Science and Technology) explained to television and newspaper media.